SEE NOTE AT BOTTOM-MILDRED'S HAS SINCE CLOSED. Mildred and Michael Barnes have been serving up Southern home cooking, South Georgia style, for 5 years in Fort Myers, and are in their 4th year at 3207 Cleveland Avenue. 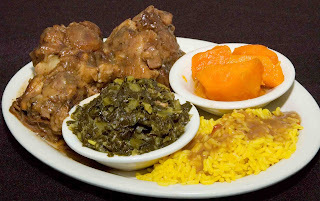 This is good Southern comfort food, soul food to some, with Oxtails ($12), Short Ribs ($9.50) and Gravy, Fried Chicken, Hog Maws ($9, Sunday only), Single (8) or Double Pork Chops ($10), and crispy Fried Catfish. 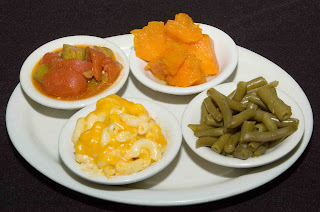 Side orders include Candied Yams, Collard Greens, Corn, Corn Fritters, Fried Okra, Green Beans, Lima Beans, Macaroni & Cheese, Mashed Potatoes, Okra & Tomatoes, and Potato Salad. Two sides come with a meal. The bakery serves Sweet Potato Pound Cake, Plain Pound Cake, Red Velvet Cake, Banana Cake, and Sour Cream Pound Cake. 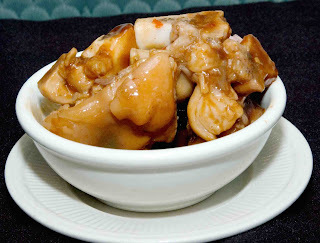 I can vouch for the freshness and especially recommend the wonderful taste of the Oxtails, and the infrequently served Vinegared Pigs' Feet, a rare treat-they don't look like what what they are (photo below), and they alone are well worth the visit. Mildred's can be packed at lunch time, with regular customers from evey walk of life. 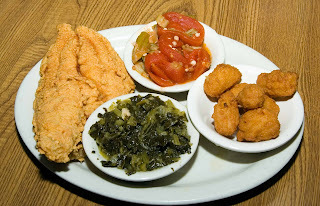 The fried catfish is crisp, and the pork chops are flavorful. Side orders of veggies often come in cups. 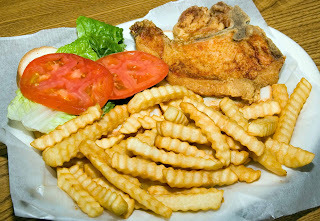 10/08 MILDRED'S CLOSED EARLIER, AND COUNTRY HARVEST HAS OPENED IN THE SAME LOCATION, SERVING COUNTRY FOOD. CHECK IT OUT, AND LET ME KNOW WITH A COMMENT. PERHAPS MILDRED'S RESTAURANT AND CATERING EXPANDED TOO QUICKLY IN THIS ECONOMY-I DO NOT KNOW. I'LL BE #1 ON LINE TO BUY HER COOKBOOK, WHEN PUBLISHED. HER COOKING WILL BE MISSED.